Curve studied by Cotes in 1722, Aubry in 1895. Other name: Cotes' spiral (including the Poinsot spiral). Polar equation: (or ) with n real > 0. Algebraic curve iif n is rational, of degree n if n is an odd integer, and degree 2(n – 1) if n is an even integer. The epispirals are the inverses of roses with respect to their centre. They also are the Brocard transformations of a line, the pole being outside the line. The curve is composed of an infinite branch obtained for : and of all its images by rotations by angle for integer values of k.
When n is a rational number with numerator p, and denominator q, the curve is symmetrical about O iff p or q is even. 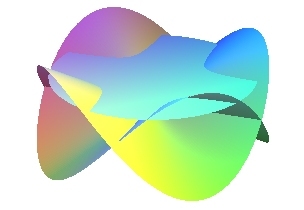 In this case, the curve is composed of 2p branches derived from the initial branch by rotations by angles and + p.
When p and q are odd, the curve is composed of p branches derived from the initial branch by rotations by angles . For small values of n, the curve winds around the circle with centre O and radius a (but it is not an asymptotic circle, the curve winds around it only a finite number of times). The epispirals are the sections of sinusoidal cones by planes perpendicular to their axis. See also the spherical sinusoids. The epispirals are the projections of the geodesics of the cone of revolution on a plane perpendicular to its axis, the half-angle of the cone being equal to . The Poinsot spirals are solutions of the problem that consists in determining the trajectories in space of a massive point subject to a force centred on O proportional to (this force is, thanks to the Binet formula, proportional to which is here , with ); the other solutions are the Poinsot spirals, with intermediary case the hyperbolic spiral, see this link. Is it because the base pattern reminds of the awn of an ear of wheat (épi in French) that the curve has this name?